Chinese investors hoping to gain US residency through pumping money into a real estate project linked with the family of Jared Kushner, son-in-law of US President Donald Trump, should be cautious as this way of getting a visa takes years and it may not go as smoothly as advertised, industry insiders said Wednesday. The two-tower luxury apartment project, named Kushner 1 or One Journal Square, is located in New Jersey, according to the website of Beijing-based immigration agency Qiaowai. 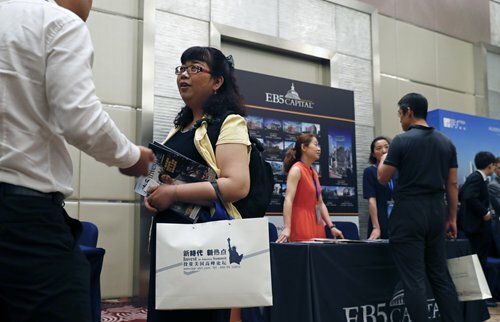 Chinese investors are being asked to contribute $500,000 each to fast-track their US green card applications through the EB-5 immigrant investment program. Nicole Meyer, Kushner's sister, attended pitches for the project held over the weekend in Beijing and Shanghai. EB-5 is an immigration program that allows foreign investors to pour money into US projects that create job opportunities and then apply for permanent US residency. However, commenting on the EB-5 visa program, some industry insiders noted that getting permanent US residency through investing in property could be risky. "Currently, there are more than 230,00 Chinese families waiting to submit their application documents to US Citizen and Immigration Services (USCIS)," Wang Lunwen, CEO of Sky Migration, told the Global Times on Wednesday. Wang noted that the USCIS only issues a certain number of EB-5 visas every year and that Chinese investors who put money into the Kushner project would probably need to wait at least seven years to submit their materials. "The time period is too long, especially considering that some of the families are applying for US visas for the sake of their children's education," he said, adding that applicants may end up with nothing, as the pass rate for the EB-5 program is only around 50 percent. "Based on my knowledge, the agreements signed between the immigration agency and investors are in the form of raising private equity, and this carries high risks as the agency provides no guarantee for the safety of the investment or securing the visa result," Wang said. According to the marketing materials for the project, the developer KABR Group and Kushner Companies are hoping to raise 15.4 percent of the funding, or $150 million, from Chinese investors. "Property developers can seek funds through other financing channels like bank loans, but the reason why they came to Chinese investors is that raising money through the EB-5 program is the cheapest option for them," Wang stressed. Some industry analysts also expressed concerns over whether the project could proceed smoothly and create the 6,616 jobs claimed by the marketing materials. "Actually, investing $500,000 does not qualify applicants for the EB-5 visa; the key criteria is whether the investment has successfully created more than 10 job opportunities," an employee with Guangdong-based immigration agency MCD Visa who wished to remain anonymous noted Wednesday. Also, the Kushner 1 project has already suffered various problems, Bloomberg News reported on Wednesday. The property's anchor tenant, tech start-up WeWork, has decided to pull out, resulting in the loss of "more than half the project's subsidies." Besides, Jersey City Mayor Steven Fulop has said that the city administration does not support the Kushners' new petition for $30.4 million in city bonds and a three-year tax abatement, said the report. "The lack of funds could seriously delay the project," the employee at MCD Visa said, noting that a property project in Manhattan promoted by Qiaowai in 2015 also hit heavy delays because the developers had not raised enough funds. But things might be different if the project is closely tied to the US president's family, the employee said, noting that this is the key selling point for it. CNBC reported that during the sales pitch in Beijing on Saturday, "Meyer mentioned her brother during the presentation, which included a photo of President Trump identifying him as a key-decision maker on the fate of the EB-5 program." There has been an "increasing number of calls coming in to book seats in the upcoming presentations in Shenzhen and Guangzhou in South China's Guangdong Province," a Qiaowai salesperson's WeChat account showed.